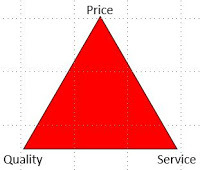 Although it would be difficult to nail down every litigation matter within the boundaries of the Project Management Triangle (see https://en.wikipedia.org/wiki/Project_management_triangle), there are certainly some grains of truth to be found. 1. Price – The lowest bid wins! Unless you work for a government agency and are forced to award a contract to the lowest bidder regardless of qualifications and experience, this might not always be the best option. That’s not to imply you shouldn’t be cost-conscious, but there is a lot more to the game than who’s the cheapest you can find? If you’re just looking for cheap above all else, perhaps one could safely assume that counsel and client are cheap, as well. If that’s the case, then so be it – it shouldn’t be too difficult to find someone who claims they can support your trial at a fraction of the cost of local “market rates.” There are usually good reasons for varying cost levels, and if it seems to be too good to be true, don’t forget there are other creative ways to lower costs, including cost-sharing between parties – this is something we’ve been seeing quite a bit recently. 2. Quality – Get it right the first time! 3. Service – I need it ASAP! In many cases, the luxury of time has been removed from the equation before a provider is selected. This is often the result of delays in securing trial prep and trial presentation providers due to settlement conferences and mediations. A trial date can quickly jump into position after a holiday or other delays in the case. I’m not making this stuff up – I’ve seen it twice in the last two weeks. It’s really not the best strategy to wait until the last minute when there are no options left on the table for settlement. You may find yourself scrambling to find anyone available on such short notice. That’s probably something no client wants to hear. Conclusion – Finding the perfect fit. Ideally, you will find someone who can offer you value. A provider offering value will be setting up a well-balanced triangle for you – one at a reasonable and fair price, with decent qualifications and experience, and who is up to the task of getting everything ready to go in a timely manner. Asking others for referrals and running web searches can help you get started. Be as specific as possible, narrowing your search to the services needed and the location. If you need a Trial Presentation provider in Los Angeles, that’s what you should search for.